Our goal is to use as many of the abundant local apples that grow in our city every year. Most of them are excess to homeowners yet there are hungry people that would love to have them. Then challenge has always beno how to connect them. Over the years, Fruits of Sherbrooke has given away as many as we could to group homes, small food banks and family resource centres, community kitchens, university food banks and even local wine and cider makers. In 2014 we estimate that we re-directed about 15,000 kilos of apples in these ways. We tried to give them to schools that had snack programs but it was difficult to coordinate getting the right kind of apples (eating not cooking) to the right places at the right times. The school snack programs are not set up to sort through the apples and wash them on the day of delivery, nor could they store them if too many arrived. E4C is a charity in downtown Edmonton that has been offering nutritious programs to schools in need for over 20 years. Their Nutrition programs support 24 schools to provide healthy snacks and breakfasts to hungry kids, and full lunch menus in 10 schools in the city. We approached them to see who we could work together. In the fall of 2015 we organized a Kickstarter campaign to do exactly that - to give us the funds and support to get this program off the ground. We were totally delighted to raise $17,000 and still thank everyone who believed in the idea. Based on the apples collected the previous year we guessed we could make 50,000 snacks. Then we hit the challenges: almost no local apples because of drought and very late start of program; difficulties with equipment, the kitchen, volunteers, and packaging. It was a steep learning curve but by the beginning of January 2016 we were finally producing snacks that kids liked. Apples - the core of our enterprise!! I mentioned that we did not have many local apples. At the end of November a BC apple grower kindly donated 950 pounds of apples, a trucking company shipped them and a local food distributor kept them in cold storage for us. (See Supporters page for details.) Finally we were in business at the beginning of December and made our first delivery to E4C at the end of the month. Washing, slicing and coring apples for the dehydrator. Our Vanna's of the dehydrator! Weighing then sealing apple chips into single serving bags. 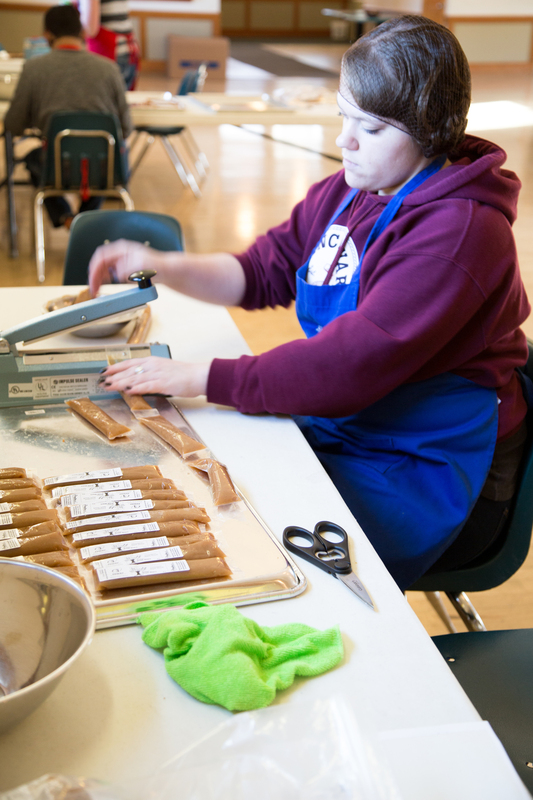 Filling tubes with applesauce before being sealing into single servings. Sealing apple sauce into single serving tubes and adding labels. Delivery of applesauce tubes and apple chips to E4C. Dehydrated apples. When cut across the equator one gets a star shape in the middle, so this is where we got our project name - Fruit Stars. We slice fresh apples and then dehydrate them for about 10 hours. Fruit Leather: We grind fresh apples into a pulp and spread it on sheets and dehydrate it as well. Applesauce: loved by kids but we were challenged to find a way to serve it that is quick and easy for the snack program volunteers but keeps it safe. Our final solution is tubes - like the popsicles. Cute and popular with the kids - but time consuming for volunteers to make. Banana Chips: We have recently been given over ripe bananas. The skins look old but the fruit is still firm and white. These are highly prized by kids as they are super sweet. 1. Our volunteers. We cannot say enough about them, nor get anything done without them. They include: a family group of about 15 with all 3 generations; high school students who come on their own or bring friends and family; seniors who come on varying schedules and form the core of our workers; U of A CSL students; Goodwill Industries and programs for people seeking community and work experience; parents and youth; office work groups; and individuals who are curious to see what is happening. They are wonderful for the time and energy they share, and especially for the knowledge they bring as we try to learn how to work more efficiently within the limitations we have. 2. Donations: as recognized on Supporter's page. 3. We have been able to supply about 2,00 individual snacks each month to E4C since the beginning of 2016. I should point out that Fruits of Sherbrooke has supplied workers for a couple hours 3 days a week to prepare apples for dehydrating. This has been neccesary to generate a regular supply of apple chips. Then volunteers come for a 4 hour shift on most Thursday and Saturday mornings. 4. Equipment: Through donation or our purchase, we have finally been able to get the right equipment for many of the processes. We now have 3 dehydrators, a commerical slicer for the apples and bananas, a sausage stuffer to fill the applesauce tubes, and a commercial food processor will soon be coming to make applesauce and grate apples for the fruit leather. Thank you to all for their generosity. 1. Freezers: When the fall comes, we will need to store applesauce and fruit leather mixture. All of these items have to be made when the apples are here and then packaged over the winter months. We will need about 4 chest freezers. 2. Volunteers: there is a steady rotation as people have other priorities. 3. Funding: This program has been successful even while we have been quietly working out of the limelight. Now that we have gone public, the donations will multiply and the capacity will need to be scaled up. We will need rented kitchen space for Fruit Stars, more equipment and full-time staff to keep things running smoothly. Volunteers will still be our core workers - as this is a community driven food program that feeds hungry people in our city. 4. A kitchen: we need to rent a kitchen that is approved by Alberta Health with storage space for equipment and hopefully for 4 chest freezers. 5. Although we are presently supporting the school snack program, we know that dehydrated apple chips would be a handy and healthy snack for adults who are also hungry. This city has the apples!!!! We are now creating the ways to preserve and package them. Let's use local food as one of the options to feed hungry people in this city.